Last weeks assignment was to print out a poster of a campaign that contributed to inspire, to bring awareness and to awake individuals, and collectivity towards action. Today, each person had put their poster on the wall and talk about the story of their poster for two minutes. 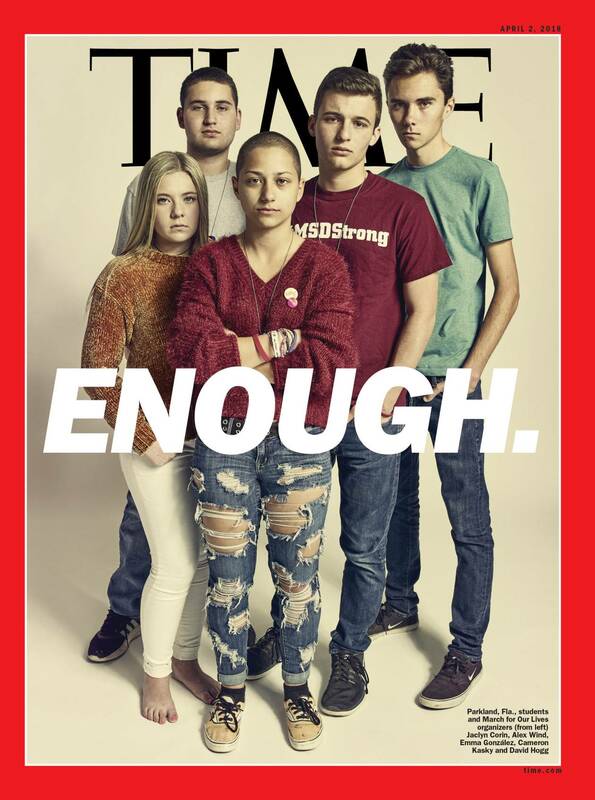 In my case, it was the following cover of the Time magazine in April 2018. In February this year, a mass shooting happened at the Marjory Stoneman Douglas High School in Parkland Florida. An ex-student shot 13 students and three teachers dead and wounded multiple other people. After this tragedy, a group of students decided to establish an activist group or even a movement in order to tighten the laws on rifles or weapons in general. Just seven days after the shooting, the first demonstration happened, right after a coincidental poll on stronger weapon laws was rejected. The group Never Again MSD continued the fight against the weapon law and Bump Stocks, a device that turns semi-automatic rifles into fully automatic rifles. Currently, buying automatic rifles is illegal, still, ironically this part is legally accessible in most States and fairly cheap. It is one of Never Again MSDs main goal, to forbid Bump Stocks. In March they organized the March For Our Lives, a peaceful march that took place in lots of different States and even other countries as well at the same time. Only one month later, the Time magazine wrote a report on their effort and target and even dedicated them their cover. The article itself was titled as The School Shooting Generation Has Had Enough. We continued to talk about the essentials of Interaction or even more precisely on the meanings of inter. We thought of problems of Intersectionality. So a black woman, for example, would not fit in the category of white people, nor is she a black man. How does society treat people that do not one hundred percent belong to a category? One of these examples are Drag Queens. The goal of this discussion was to propose the option of choosing the topic of Activism in our BA thesis. We could try to contribute to a movement, or even create one ourselves, even if we are not directly involved in it. Where could I contribute?